At the eastern end of the Jin-Qu basin in central Zhejiang Province, 94 km (58 miles) south of Hangzhou. YiWu was ranked 47th in comprehensive economic strength of China's city-counties nationwide in 1995, and became Zhejiang's first city to undergo experimental comprehensive economic reform. It has jurisdiction over 15 towns and 8 villages, covering 1100 square kilometers, 15 of which are urban area. The Small Commodities Market in YiWu is famous throughout China. With this road map you can organize your stay in Yiwu at best, managing your hotel accommodation and your sequence movements so as obtain most comfort and productivity from your sojourn. 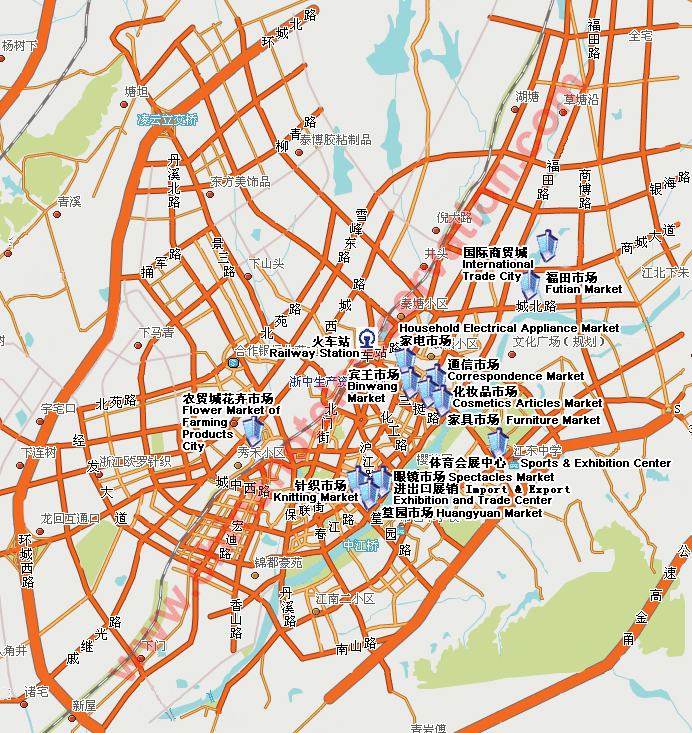 If you are visiting Yiwu, you can use this useful map to understand the city and move without problems as tourist or business traveller to any part of city, including hotel solution, railway station, airport, exhibition hall, fair palace, sport areas and tourist destinations.